This particular product can be used as an anchor chart, a student hand out, within an interactive journal or all of the above! 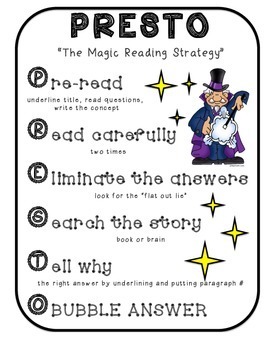 PRESTO is a reading strategy that has proven fruitful with my third graders and district wide! I use the PRESTO method for my 3rd graders on their state standardized reading test (in Texas it's called the STAAR) and it has proven to be extremely successful. It causes the student's to slow down, think on a deeper level, dissect what they are reading, and prove their work. This simple, yet effective, method can be utilized for all grade levels.